After a disaster where our Kinect seemed to have vanished into thin air, we had to wait on a new one arriving to be able to use any of our Kinect games. Warner Bros. had sent us a Harry Potter Xbox 360 promotional copy, and my boys were itching to get their fingers on it and play in a new world. 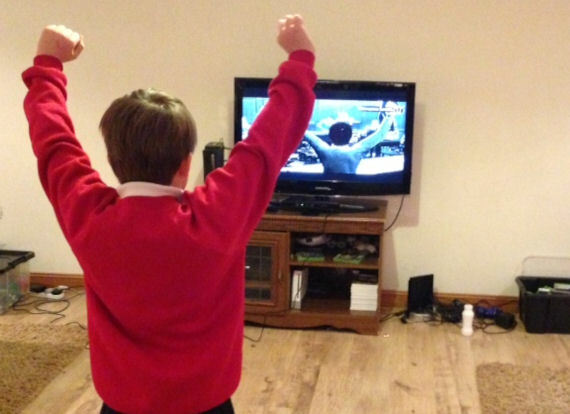 The day came that the new Kinect finally came and Harry Potter has seen a fair few outings in the lounge with boys fighting by using their wands to cast spells and find new things to unlock. To play the game, new players have to learn how to cast their spells in Professor Flitwicks Class and take lessons. The wingardium leviosa is the first one they have to learn, and teaches them how to levitate. The arm and hand motions mean that kids can identify with how they have grown up with wizards in their lives. Players need to wait until their wand chooses them, just like in the films and then they are sorted into which house they will be in. Using the Kinect means that there is much more involvement with the game, and players can really feel part of the experience with hand and foot movements. Once they can cast spells they are ready to try getting into the full game. I’d definitely say it helps to have watched a few of the films to play this game and it might be difficult for some to follow the story otherwise, but as a stand alone, the segments are easily playable whether you know the films or not. Would I have paid for this, yes, I would. The Kinect is great for winter and getting couch potato Xbox fans up onto their feet and doing a little interaction. It can be played with 2 players which is always a boost with Xbox games. « Traditional Scottish Stovies with Oatcakes and Beetroot – Slow Cooked & with the Kids Baked Beans to serve. I like getting the kids active in winter when it’s dark early outside. Great for that.